Reeds Diffusers are terrific... they are a great way to add a aroma therapy to the air in your spa, salon, office, home... pretty much anywhere. Pure Spa Direct just added amazing oil diffuser components form Ginger Lily Farms that let you customize your Reed Diffusers to your liking. 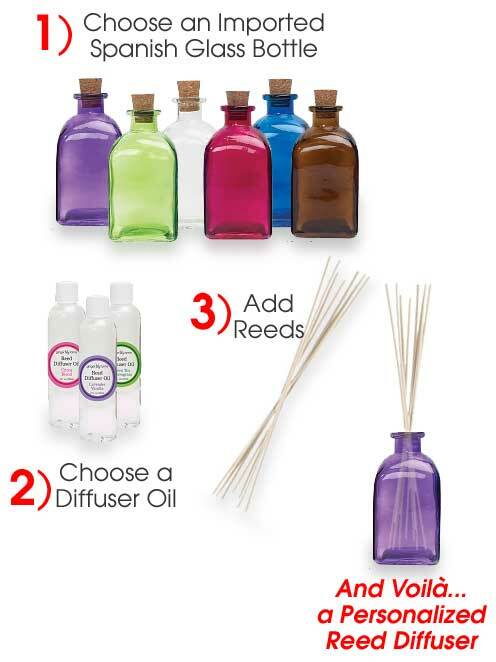 Choose from the amazing Spanish glass jars, add reeds and then select your diffuser oil... voilà... personalized diffusers!! No Flame or Heat: Unlike candles, the reed diffuser has no flame to worry about. This makes the reed diffuser a safer alternative to candles. No Going Out: with incense or candles the aroma is temporary relying on active lighting. The reed diffuser lasts all day and night. The only monitoring a reed diffuser needs is a weekly turning of the reeds. No Smoke: incense is nice but the smoke is not so wonderful. The reed diffuser achieves the same purpose but without any smoke. No Wax or Mess: incense has ashes, candles have wax, the reed diffuser has neither. No Aerosols: unlike sprayed scents, the reed diffusers does not have any added chemicals. No Electric Power: you can place a reed diffuser anywhere without having rely on an outlet or change batteries. No Heat: heated fragrances like plugins actually damage the essential oils while the reed diffuser protects the integrity of the oils.